In this post we hear from a parent who has experienced the benefits a hearing implant has given her son with SSD. Jennifer Parenti, from the US, is a Teacher of the Deaf and enjoys supporting individuals with hearing loss through their hearing journey. Her son, who has profound hearing loss on one side, is a cochlear implant recipient. In this post, Jennifer reflects on her own journey with her son and shares her tips for other parents. When my son was almost four years old he was identified with a profound hearing loss in his left ear and normal hearing in his right. At the time, my husband and I were shocked to learn that he had any hearing loss at all! There was a brief period of disbelief. We would speak into his left ear quietly to see what, if anything, he could understand. We soon came to the realization that it was time to start thinking about how to best support him. After much research, we made the decision to provide our son with a hearing implant. 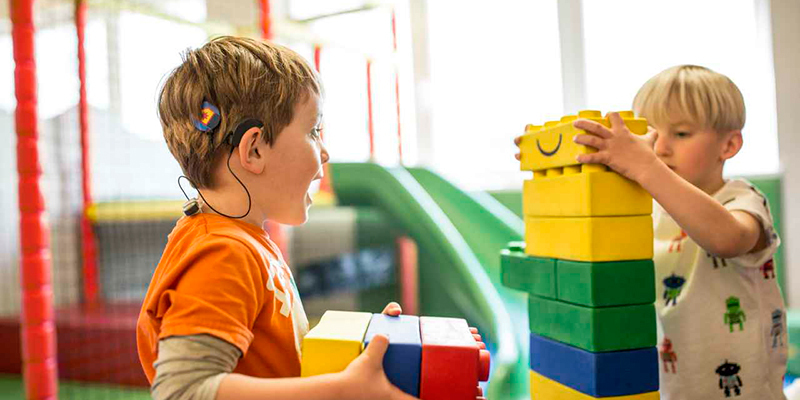 He received his cochlear implant at five years old, and he’s now eight years old. He doesn’t ask us to repeat instructions or comments as often as he used to. He doesn’t move his body closer or position his hearing ear toward the person speaking. His ability to navigate a noisy restaurant has eased considerably. His anxiety in a loud classroom/playground has reduced. We have also altered our environment to support his ability to hear us. We’ll be sharing more about Jennifer’s family’s story, so subscribe to get the latest MED-EL Blog stories! Want to read more stories about people with SSD? Find out about the inspiring journey of Johanna, a professional musician and singer with SSD who returned to music thanks to a CI.